Baking a ham roast is a fairly simple process. If your ham is frozen, you'll get the best results by defrosting it in the refrigerator before cooking. Give the ham at least seven hours per pound to thaw in the refrigerator. You can also bake a frozen ham, but it will take about 1.5 times longer, on average, notes What's Cooking America. This also tends to negatively affect the roast's texture. Set the ham roast out on the counter for about an hour before baking. Position an oven rack so the roast is situated in the middle of the oven during cooking. Preheat the oven to 350 degrees F.
Line a shallow roasting tray with aluminum foil to facilitate cleanup after baking your ham roast. Place the meat in the tray, fat side up. Trim some of the fat if there's an excessive amount, if you like. Leave more than 1/4 inch of fat on the roast, though, as it seals in juices during baking and marinates the cooking ham as it melts over it. Score the fat into a diamond pattern by making cross-cuts through it with a large, sharp knife. Rub on any seasonings your recipe calls for. Wait until the last hour of cooking to apply sugar, honey or a glaze. Press an oven-safe meat thermometer down into the center of the roast, taking care not to let it come into contact with bone. 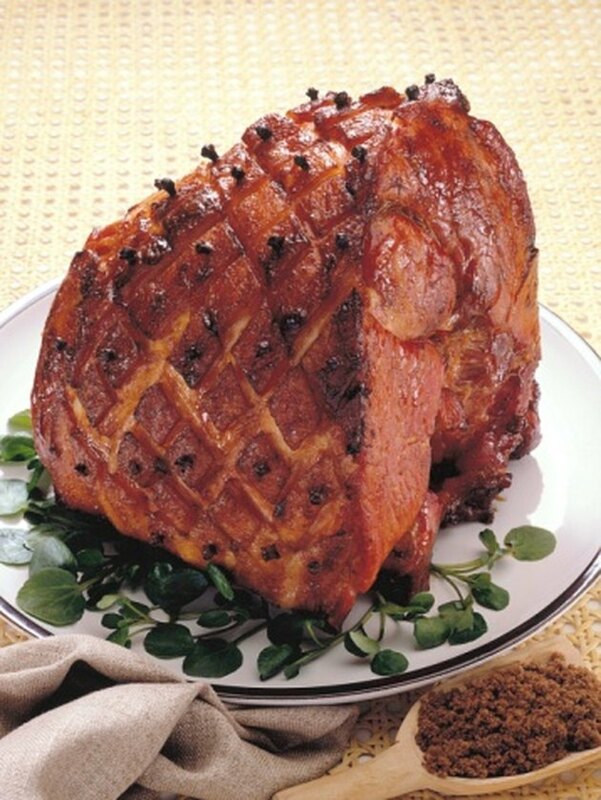 Bake the ham roast until it reaches 155 degrees F. Refrain from basting it with its own juices during cooking, as this often makes the roast quite salty, and basting is unnecessary as long as you left enough fat on the meat. Plan to bake a boneless ham roast for about 30 minutes per pound and to bake a bone-in ham roast for about 25 minutes per pound. Remember that cooking time is not exact, as it differs from oven to oven and it is affected by the size of the ham. Remove the ham roast when its internal temperature hits 155 degrees F. Let the roast sit for at least 15 minutes, loosely covered by a sheet of aluminum foil. It will continue cooking, and its temperature will rise at least another 5 degrees to the recommended 160 degrees F.